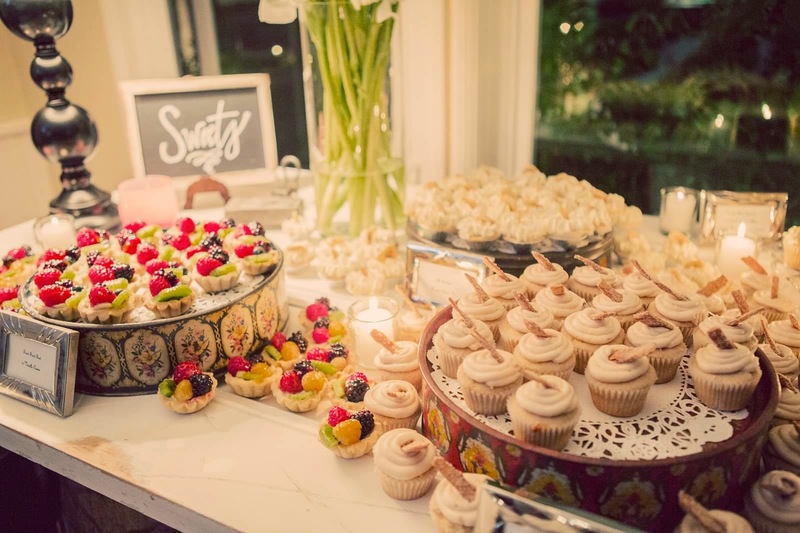 If you've been following LiveBakeLove for a while, you know that last year we made desserts for a friend's wedding. 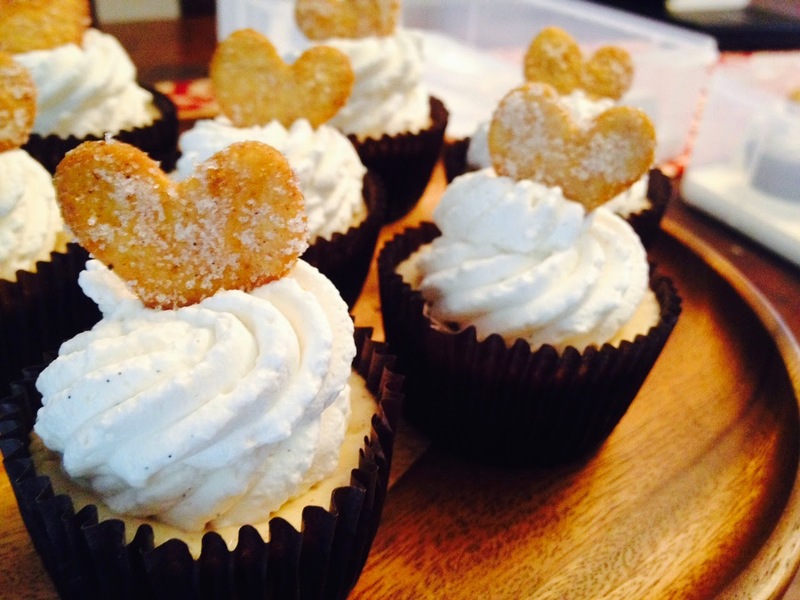 One of the desserts we made were these Churro Cupcakes. Since then, this recipe has been a big hit for us. If you haven't tried it yet, I strongly recommend that you do. Well, as life would have it, this same friend is now pregnant with a baby girl and we had the honor of catering her Baby Shower! I wanted to pay tribute to this special occasion by making an updated version of the Churro Cupcakes we served at her wedding. And really, what better update is there than cheesecake? I took the same flavors of the Churro Cupcakes (cinnamon, dulce de leche and vanilla) and incorporated them into this delicious, creamy, cheesecake recipe. But wait, I didn't stop there! I used Biscoff Cookies for the crust. Yum! Who doesn't love Biscoff (aka Cookie Butter)? And of course, no Baby Shower dessert is complete without a cute topper. These "Churro" Hearts were the perfect finishing touch. Both recipes are winners & we hope you give them both a try! Preheat oven to 300f. Line cupcake pans with 28 cupcake liners. Place the Biscoff cookies in the bowl of your food processor and pulse until crumbs are formed. Place the Biscoff Cookie Crumbs in a medium size bowl. Add about half of the melted butter and mix with a fork until well combined. Gradually add and mix in more butter until the mixture holds together when squeezed in the palm of your hand. You may not need to use all of the melted butter. Evenly distribute the crumb mixture between the 28 prepared cupcake liners and press firmly to create a crust. Set aside. Place the cream cheese, sugar, cinnamon and vanilla in a large bowl. With your hand mixer, beat the mixture at medium-low speed until creamy. Scrape down the bottom and sides of bowl with a rubber spatula. Mix in the eggs one at a time at low speed mixing just until combined after each addition and scraping down the bottom and sides of the bowl with a rubber spatula after each addition. Add the sour cream and mix on low speed just until combined. Divide the mixture evenly between the prepared cupcake pans. Place the Dulce de Leche in a small bowl and microwave for a few seconds and stir well to soften slightly. This makes it easier to swirl into the cheesecake batter. Top with approx. 1/2 teaspoon of Dulce de Leche and swirl gently with a toothpick or skewer. Be careful not to go too deep so you don't disturb the crust. Also don't swirl too much or the caramel will dissolve into the cheesecake batter. Bake (2 pans at a time) just until the cheesecakes are set and don't jiggle in the middle (approx. 20 minutes). The cheesecakes may puff up a little, but they shouldn't be puffy and cracked. Remove from oven and place on a wire cooling rack. Allow to cool to room temperature then place in the fridge until chilled. Remove the cheesecakes from the pans and allow to chill in the refrigerator in an airtight container for 8 hours or overnight. Place the heavy whipping cream in the bowl of your electric stand mixer fitted with the whisk attachment. Tip: I chill my bowl and whisk in the freezer for 10 minutes before mixing. Place 1/3 cup of granulated sugar and 1/2 teaspoon ground cinnamon in a bowl and mix to combine. Set aside. Using a small 1" heart shaped cookie cutter, cut 28 hearts from the wheat tortilla. Working in batches, fry the tortilla hearts until golden brown and crispy, then immediately toss in the cinnamon sugar mixture. Top with the cheesecakes with the whipped cream and garnish with a churro heart. If you love pie, I mean really, truly, deep down in your heart love pie, especially Banana Cream Pie, then you will LOVE this recipe. I needed a dessert for a "Mexican inspired" dinner I was making for a friend that had recently been ill. I made a Corn and Poblano Lasagna (recipe to come), Kale Salad and this delicious Mexican Banana Cream Pie. I'm asked all the time where I get my inspiration from. Honestly, from anything that sounds, tastes, looks or smells delicious! I got my inspiration for this recipe while watching an episode of The Kitchen hosted by one of my favorite Food Network chefs, Marcela Valladolid. She was making her Dulce de Leche Banana Cream Pie. That was all I needed to be inspired! I made Marcella's recipe and it was amazing, but I wanted something a bit more like the traditional American Banana Cream pie so I came up with my own version. It has all the same ingredients as the original recipe, just made a bit lighter in texture. Both recipes are delicious, so I wouldn't be offended at all if you make her recipe (which you can find here), but I really hope you'll give this recipe a try as well. I can't say enough how much I love this pie! It is truly a pie lover's dream - sweet, salty, crunchy and creamy all in one. 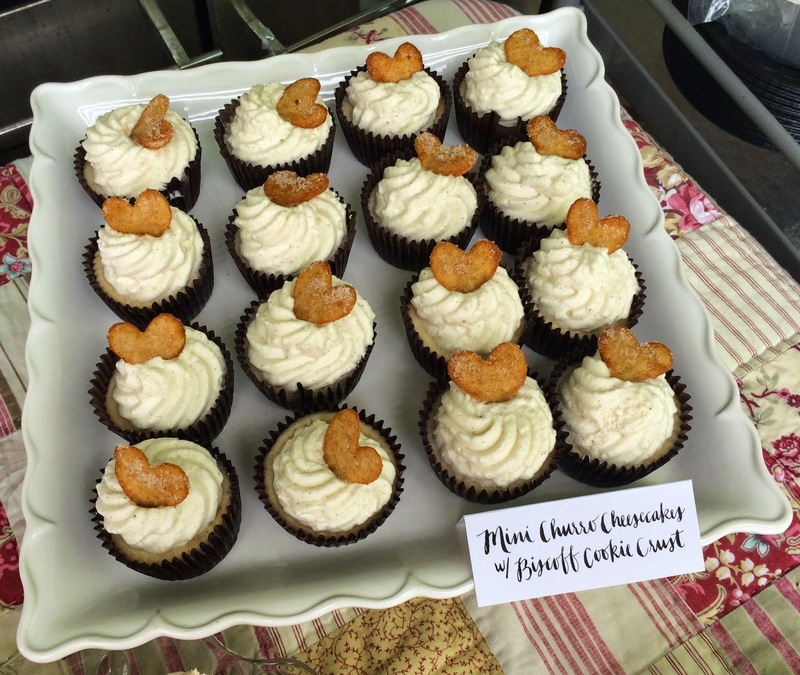 And of course, you can't forget the star of the show, the fresh bananas! 1. Mix Graham cracker crumbs, peanut crumbs, cinnamon and butter. Toss to combine until the crumbs are coated. 2. Press lightly into the bottom and up the sides of you pie plate. 3. Refrigerate for 20 minutes. 1. Cream the softened butter and cream cheese until well combined and fluffy. 2. Add the powdered sugar and cinnamon, beat slowly until combined. 3. Add the heavy whipping cream. Whip until stiff peaks form. 2. Mix the caramel enough to loosen it up. Not too much or it will become liquid. 3. Fold in whipped cream. After all of the ingredients have been chilled, slice the bananas. 1. Remove cold crust from refrigerator. 2. Spread the caramel into an even layer on top of the crust. 3. Layer the sliced bananas over the caramel. 4. Spread the cream cheese mixture in an even layer over the bananas. The Best Apple Walnut Cinnamon Roll, EVER!! I absolutely love this recipe! If you love Cinnamon Rolls (like I do), you will love this recipe too! Faye and I have been a part of a Freezer Meal Swap group with a few friends which has been loads of fun! It gives us a chance to get together each month, enjoy a delicious meal, catch up on girl-talk and of course, stock our freezers with delicious food! What doesn't sound fun about that? I made these cinnamon rolls for one of our recent exchanges which I hosted at my house. I took a basic William Sonoma recipe and kicked it up a notch by adding apples and walnuts. Yum!! I have to say that these rolls are so delicious and I'm not just saying that because this is a food blog (haha)...the bread is light and fluffy, not heavy or dense at all. The filling is an amazing combination of apples, brown sugar and walnuts for crunch. The smell of the cinnamon and apples while the rolls are baking will drive you crazy! So brush off your Kitchen Aid mixer (if you haven't used it yet) and give this recipe at try! Also, if you are ever in the the San Diego County area and are craving a delicious cinnamon roll and don't want to bake it yourself (even though the above recipe it a MUST TRY HIT! ), you need check out the Elizabethan Bakery in Encinitas California. www.elizabethandesserts.com . Faye and I recently went there to celebrate by my birthday with Pecan Cinnamon Roll. I think the picture speaks for itself. ½ cup (1 stick) unsalted butter softened. 1. Add yeast to your kitchen aid bowl, add water. Leave for five minutes. You will notice the yeast will rise and expand. 2. With the Whisk attachment , add ½ cup of flour. Cover with clear plastic wrap and put aside in a warm area for 30-40 minutes. 3. Once time is up, add eggs, sugar, salt and the remainder of the flour. Mix with first with a spoon, then add the Dough Hook. Kneed it for about 4-5 minutes. 4. Add the softened butter and knead for about 10 more minutes. (If it’s too sticky, add some of the ½ cup flour till its is a nice smooth dough). for 2-3 hours. Once the time is done, take the dough out of the bowl and put on a well-floured surface. 7. Using a pastry brush, brush the melted butter over the surface of the dough, but leave about 1 ½ inches at the end with no butter no it. You need this to seal. 8. Add the nuts to the apple cinnamon mixture and mix to combine. 9. Sprinkle the apple/nut mixture over the dough except for the 1 ½” edge you left with no butter. 10.Starting at the longest end, start rolling up. Use your hands push in the apple mixture if its moving forward. 11.Once you done with the roll, pinch the side ends to seal it. Make sure the seam line is facing the bottom of your cutting board then cut the roll into 10 pieces. 12.Put the individual pieces into the prepared baking dish with the cut side is facing up. 14. In the morning, remove from refrigerator and let the dough rise for about 1 hour. .
16. Bake the rolls for 30 minutes, remove from oven and cool. Make the Icing: While the rolls are baking, make the icing by mixing together the sugar , salt, butter , vanilla and milk. Icing will be like a nice paste. Once the rolls have cooled a bit, spread with the glaze.Enjoy! Don't you wish there were more opportunities in life for do-overs? For this month's Leftover's Club, I had a do-over moment. I originally made these Cherry Almond Bars for Kathia from Basic N Delicious. A few days after mailing them, I followed up with Kathia who responded letting me know that the bars were delicious, but I still had this nagging feeling....was she just being polite? After debating with myself for a few days, I made up my mind that I would redeem myself and send her a second package using a different recipe, but incorporating the same flavors. So, for my July's Leftover's Club do-over, I made Mini Cherry Lemon Ricotta Cakes with a Lemon & Almond Glaze. Yummy! The ricotta in the batter makes the bread really moist and cherry & almonds are such a perfect combination. Here's the recipe for the Cherry Lemon Ricotta Cake. I hope you give it a try. It's so good, you won't "need" a do-over, but you'll definitely want to make it again! Join in on the fun and receive delicious baked goods in the mail every month by joining The Leftovers Club. You can sign up over at Food Ramblings. If using mini loaf pans, lightly spray 6 mini loaf pans, place on a baking sheet and set aside. Note: My mini loaf pans were approx. 4.5-5" long and 2.5" deep. You can use different size pans, but your yield will be different and you'll need to adjust your bake time accordingly. If using a loaf pan, please make sure it's a large 9-10" loaf pan and that it's pretty deep, not shallow. Loaf pan sizes can vary and if your loaf pan is on the smaller side you might have spill over. Spray your loaf pan, then line with a piece of parchment paper that hangs over the sides for easy removal. In a medium size bowl whisk together the flour, baking powder, salt and lemon zest. Set aside. In the bowl of your stand mixer fitted with the paddle attachment, cream the butter at medium speed until light and fluffy (approx. 2 minutes). Scrape down the bowl with a rubber spatula, then add the eggs and beat at low speed until combined. Add the ricotta, lemon juice and both extracts. Beat and medium speed until combined. Add the dry ingredients and pulse a few times to incorporate some of the flour so it doesn't fly all over the place, then beat at low speed just until combined. Spread half of the batter into the prepared pans. Top with half of the sliced cherries. Top with the remaining batter and then the remaining cherries. Bake at 350 until toothpick inserted in center comes out clean (approx. 50 minutes for a full loaf, 15-20 minutes for the mini loaves). Note: Bake times may vary as all ovens are different and is also dependent upon pan size. Check for doneness at the beginning of the recommended bake time and continue to check for doneness after that. If you find that your bread is getting too brown but isn't done yet, tent the top with a piece of foil to prevent over browning. Combine all ingredients (except for the toasted almonds) in a bowl and adjust consistency as needed. Growing up with a Father who comes from the South often means you have biscuits every Sunday for breakfast. It was no different in our household. While my Mom was known for cooking from scratch, she liked to use Bisquick Baking Mix to make her biscuits. It's a short cut I often used as well when I first started cooking for my family, until I got turned on to homemade biscuits. From that point on, there was no turning back. Sorry Bisquick fans, homemade biscuits are beyond comparison to anything that comes from a box. For years I struggled to make the perfect from-scratch biscuit. I tried recipe after recipe...some using buttermilk, some using regular milk, some with lots of baking powder others with less, some using all purpose flour others using self-rising....but I was never satisfied. 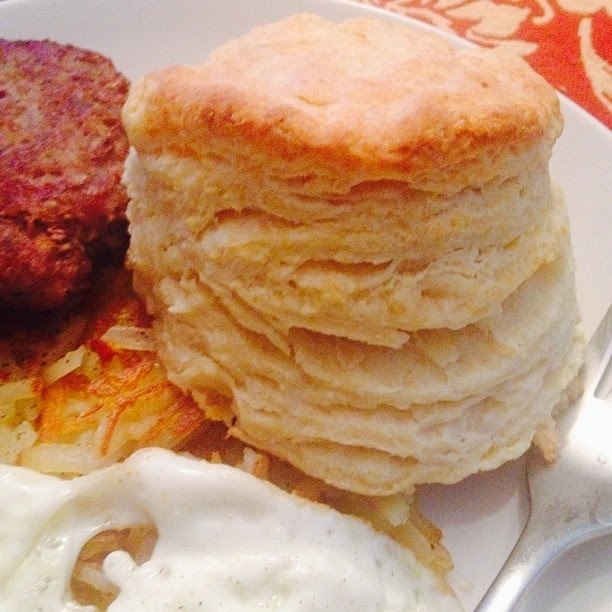 How could I get the tall, flaky, delicious looking biscuits that I've always seen in photos? How could I become a biscuit baking master instead of a biscuit making disaster? Well, I always thought the secret was in the recipe, when actually the secret is in the technique! That's when I unlocked the secrets to making the ultimate homemade biscuits. 1. Always, always, always use cold ingredients. Your butter and milk must be cold. Keep them in the fridge until ready to use. 2. Use a Food Processor. Yep, you heard me. I know a lot of people swear that making them by hand is best, but I've had the best results using a Food Processor. 3. Use the fold technique. That means folding your dough over on each other a few times kind of like a letter. This creates the layers!! But be careful not to overwork or you will heat up the butter in the dough. If, at any point you feel like you've overworked your dough, put it in the fridge for a little while. 4. Use a sharp biscuit cutter! This is an absolute must. A dull biscuit cutter will seal the edges of the dough and prevent rising. For a long time I cut my biscuits using a glass that had a wide rim which I later realized was a no-no. 5. Don't twist when cutting your biscuits! Just press down and lift straight up. If you twist, you're basically sealing the edges which will prevent your biscuits from rising. 6. Don't place your biscuits touching each other. Again, placing the biscuits touching each other may look nice, but you are preventing the biscuits from rising as high as possible. And there you have it, the secrets I've learned through lots of trial and error. Now go out there and bake some amazing biscuits!! If I can do it, you can too! Here's the biscuit recipe I use. It makes 5-6 large biscuits. Place the flour, baking soda, baking powder and salt in the bowl of your food processor and pulse to combine. Sprinkle the butter over the flour and pulse a few times until you have a course meal. Place the flour mixture in a bowl. Pour about 3/4 cup of the milk over the flour and use a rubber spatula to gently combine. A soft dough should form. If the mixture is too dry, add a little more milk around the edges and fold again to combine. Turn the dough out onto a lightly floured surface. Gently flatten into a small rectangle then starting at the small end, fold one end over onto the other end and gently flatten. Repeat this process 3 more times. Be careful not to overwork the dough. After folding, gently flatten the dough to about 1 1/2" thick and cut with a sharp biscuit or cookie cutter. Gently reshape the dough and cut again until you have about 5-6 biscuits. Place biscuits about 1" apart into a buttered skillet or onto a parchment lined baking sheet. Bake until golden brown. Remove from the oven and top with butter. Serve immediately with extra butter, honey and/or jam if desired.